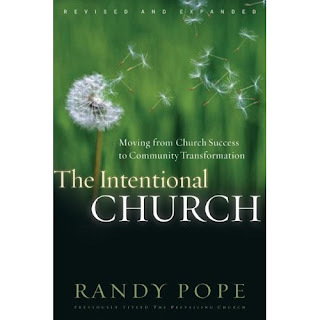 Right now while on vacation I’m reading a book called The Intentional Church by Randy Pope. It brings to light some things I’ve thought for a long time, and Pope articulates them so well. This is so true. In pastoring I have experienced that people think maturity is determined by the amount of time you have been a Christian. A woman in one of our churches would take pride often in the “amount of years she had been saved” and thought this should open up many opportunities for her in ministry. However she was probably one of the most carnal people I knew. Pope goes on to say, “I am also amazed at how many people that consider themselves mature in Christ but cannot identify anyone who has entered the Kingdom because of their life and witness.” Again, something to really think about. Later on in the book he shares about a conversation with Dr. Cho in Korea where he asked him what accounts for his church’s steady growth of at least 20% a year for all these years. Cho shared that it’s easy – the entire church is divided into groups of ten. Every group is responsible for leading at least two people to the Lord each year. Cho was asked, “what if they don’t?” He responded, “Then they are disciplined.” It is believed that if they have not led at least two people to the Lord that year, there is no way they could be considered spiritually mature. Can you possibly imagine this happening in our churches in America? No. And that’s exactly why they have a church in Korea numbering 800,000 and your average church in America is less than 100 people. Interesting…I remember when I was just a teenager getting ready to go to bible college and I had the thought that a person could not possibly be spiritually mature if they were not leading people to the Lord. I made this statement to some “elders” at the time at my home church and was told that not everybody had the gift of evangelism and that some people just didn’t have the personality to do that. It didn’t sit right with me then but I did not have the age nor the experience or platform to continue to make my point and have it heard. I know there are many elders, deacons and even pastors of many churches (and their spouses) who have not led many people, if any, to the Lord. (I mean personally, not just through an outreach of the church.) One time I was in a service in one of our A/G churches where the evangelist had everyone stand and then said, if you have led someone to the Lord this year, keep standing, otherwise have a seat. Only like two people in the congregation were left standing. That’s pretty pathetic. I'm baaackkkk! And Onstar ROCKS!! !